My new XXL complete and ready to cut! 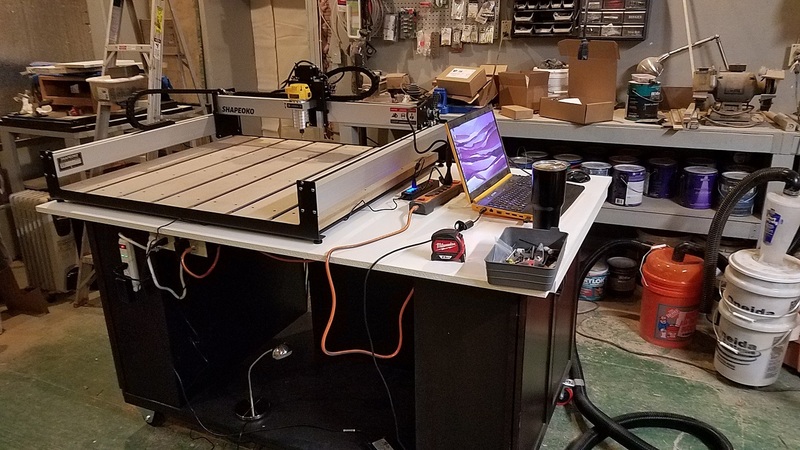 I’ve had a profesional woodworking business for about six years now and decided a cnc machine would be a great investment. I had used a friends machine a few times and was pleased with the results. After much research I decided on the Shapeoko 3 xxl and here are my thoughts after completing the build. 1.) I’m more impressed by the quality and rigidity of the machine than I expected to be. The thickness of the steel and aluminium makes it one of the most rigid tools and my shop, which contains a lot of large pro woodworking equipment. 2.) 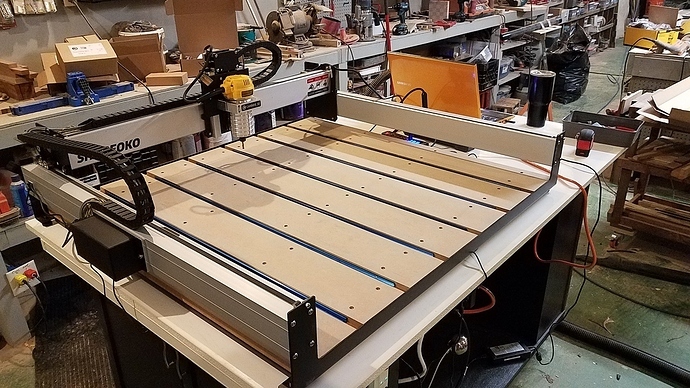 I liked the idea of buying a kit that I had to put together and hoped it would teach me something about cnc machines in general. The best part of putting it together though is I feel comfortable that I can repair and maintain the machine in the future. 3.) I had trouble at first squaring the machine. But after figuring out what was wrong and reading the great topics online about it I was able to use a little foil and shim it till it was right on. 4. 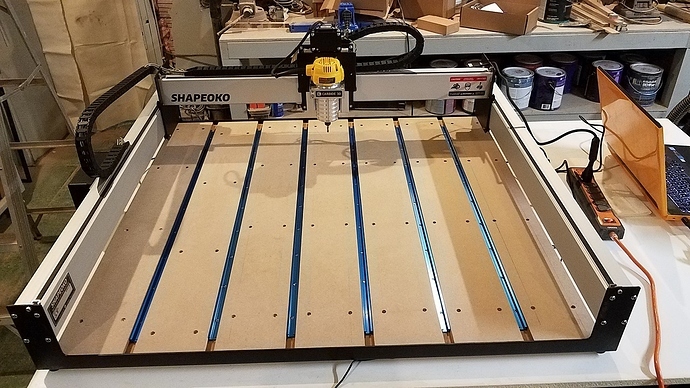 )The shapeoko community online is a big plus for me, its great that so many people share ideas and mods. doing lots more as I learn. 6.) Being made in the USA is a big plus for me. I benefit from consumers who want locally made furniture/cabinets/ect. so its important to me that I practice what I preach and buy American made things as well. Below are photos of my completed machine. I took them as soon as I had finished so its not as tidy as it should be, lol. Heavy duty locking casters to move it around my shop when needed. A mix of storage cabinets and open spaces below for future dust collection and other possible upgrades. A super sturdy and level table top made using a solid work surface over a torsion box. Electric provided through two new circuits I ran to eliminate and possibility of noise. That’s a nice setup! I’m just now finishing my own. Still have to modify the waste board with some T-Tracks I got from Rockler (same as yours?). How’s it working out for you so far? Also, having the tracks run from front to back VS side to side… I’ve seen it done both ways I guess. What’s your feelings about it now that you’re setup this way?